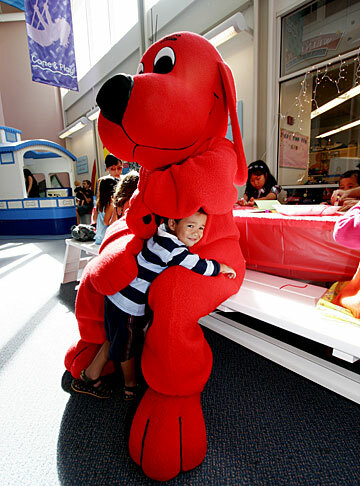 The Children's Discovery Center celebrated its seventh birthday yesterday with its newest traveling exhibit, Adventures with Clifford the Big Red Dog. Jachob Dolak, 3, is dwarfed by Clifford. With him is his mom, Cherry Dolak. 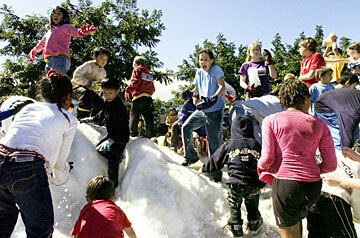 Kids and snow created fun-filled bedlam yesterday at Christ Church Uniting's Second Annual Snow Party in Kailua. The community event featured food, music, hot chocolate and 80,000 pounds of snow. 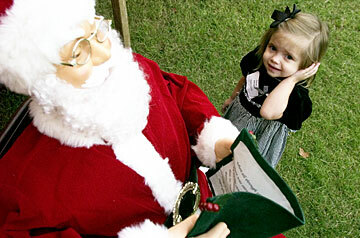 Sarah Garland, 2-1/2 years old, put her hand to her ear yesterday evening in an effort to hear the mechanized Santa Claus at the 23rd Annual Help, Understanding & Group Support (HUGS) Christmas Party at the Tenrikyo Cultural Center. Garland is a leukemia survivor who was diagnosed during a routine 12-month checkup and has been in remission for more than a year. HUGS assists seriously ill children and their families with 12 programs ranging from peer support groups to an emergency airfare fund for qualifying families in need of interisland or mainland care. People interested in volunteering or the nonprofit's services can call (808) 521-HUGS or visit www.hugslove.org. 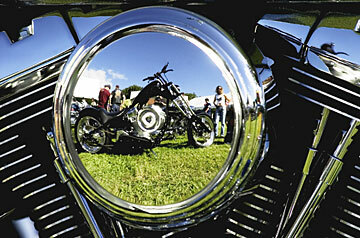 A custom bike made by West Coast Choppers was reflected on the air filter of Tattoo Crews' EVO Era entry at the Great Hawaiian Motorcycle Rally and Biker Build-Off yesterday, held at Kapiolani Community College. The event featured celebrity builders such as Shannon Aikau of Count's Kustoms and Roger Kuwahara of Kustom Fab, custom bikes owned by Motley Crue and Ozzy Osbourne, displays, live music and more.